Torval Crook is an epic Agility creature card. It is part of the Core Set. In addition to the card's availability in the Core Set, one copy is included in the Brynjolf's Heist theme deck, and one copy in the Hlaalu Schemes theme deck. "There are always deals to be made." 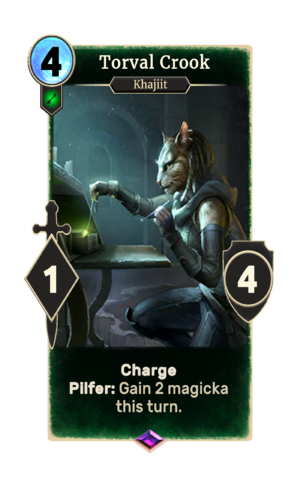 The card is named for the Elsweyr city of Torval. This page was last modified on 15 February 2019, at 14:12.